You’re in the Sabi Sands - famous for having the best Big Five game viewing in the country and in particular the highest concentration of leopards in the world! The camp is not fenced - therefore if you are travelling with children please keep a close eye on them at all times. Take a magical trip into the past with a visit to the classically timeless Kirkman’s Kamp - here history comes alive and the tales of the past are re-told and experienced in this wonderfully rich game area. The ambiance is largely due to the beautifully restored 1920's homestead that serves as the central public area - the whole ambience of the camp is colonial and gracious, of timeless tranquillity symbolised by the brightly gleaming brass doorknobs and the authentic antique furniture from bygone years. Inside the spacious green tin-roofed main lodge, stuffed heads of animal trophies peer down on big comfortable couches and gleaming wooden floors. Outside the cottages, potted ferns stand beside old style wooden benches, with hurricane lamps swinging above them. You can’t help but be swept back in time by the allure of the natural beauty and fascinating history of Kirkman’s Kamp! 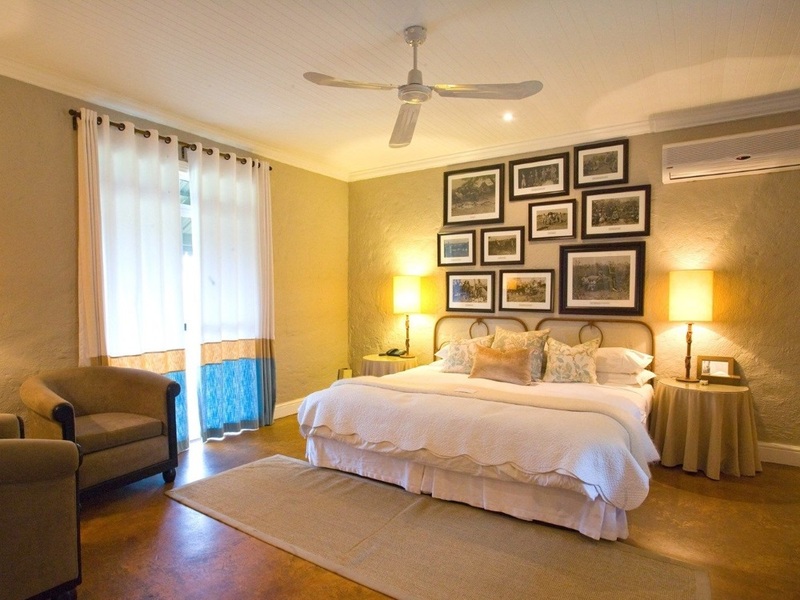 Each of the 18 air-conditioned suites has a patio (which overlooks the unspoilt savannah and boasts gorgeous views of the Sabi River) as well as an en-suite bathroom with separate showers and free-standing baths. Inside your room the atmosphere stays strictly colonial – with polished cement floors, pale blue and white curtains, and grey velvet tub chairs are set off by snowy white bed linen while genuine black-and-white photographs of hunting parties from yesteryear are displayed on the dove grey walls! Grassy lawns surround the main building set on a hill with excellent views of the nearby river. On warm days you can cool off in the infinity pool which brings welcome relief from the heat (and definitely doesn’t date from the 1920’s!) This is the perfect spot to chill out with a fresh cocktail whilst perhaps watching a herd of ellies come to drink at the river. Talking of wildlife, at Kirkman's you can experience the abundance of wildlife that roams freely between the prestigious Sabi Sand Game Reserve and the world renowned Kruger National Park. This is especially true now that Kirkman’s enjoys traversing rights over the adjacent Lion Sands area, giving access to a combined 23 km of river frontage split between the Sabie and Sand rivers. 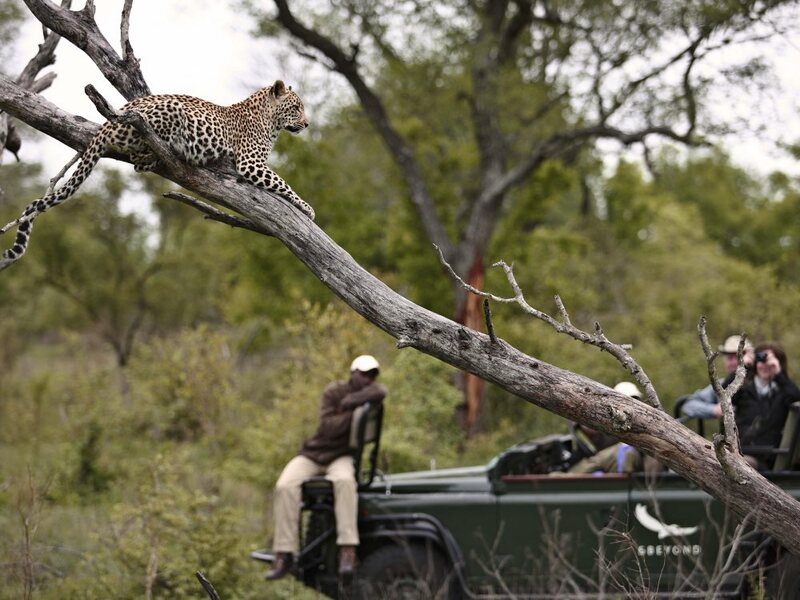 Another change that you may notice compared to the days when this lodge was part of Mala Mala, is that your Shangaan tracker now sits on the front of the game drive vehicle where he can genuinely put his superb tracking skills to good use. Your day will start with the rising of hues over the horizon, fragrant tea, coffee and biscuits or rusks before heading of on one of the twice-daily game drives. You’ll find that the entire Big Five is well represented in Sabi Sand and other rare animals, such as the cheetah and hyena are often sighted. Various antelope species - from impala, waterbuck and duiker to kudu, bushbuck and nyala - can also be seen, as can giraffe and warthog. However, it is the leopard that is the real star of the show here with the area well known for some of the best leopard experiences in Africa. But that’s not the only predator action going, as a number of lion prides have territories in the area and are regularly spotted on game drives. Although not as common as the leopard or lion, cheetah are also frequently sighted. Upon return to the camp, a deliciously heart-warming breakfast is served before you decide what the rest of the day holds - perhaps a relaxing massage or a dip in the rim-flow swimming pool before a scrumptious lunch served on the open decks overlooking the river! If you fancy exploring and experiencing the Sabi Sand first-hand, interpretive bush walks offer you the incredible opportunity to really discover the sights, smells and sounds at your leisure - as nature intended! A ranger, armed with great knowledge and a profound passion for the bush (not to mention a rifle of course!) will accompany you and show you all the little details not usually noticed from 7 feet off the ground in the back of a Landrover. After a scrumptious afternoon tea it’s time to head out again on your night drive where you may be lucky enough to track spotted hyena as they call to each other on an evening hunt or spot the beautifully patterned civet cat. Then return to the lodge for a mouthwatering dinner around a blazing fire in the boma with newfound friends. Afterwards linger over coffee and dessert, sharing memories of the day gone by. This colonial style lodge certainly does deliver the goods, combining a wonderful colonial ambience with an abundance of active wildlife – a visit to Kirkman’s Kamp will be something you savour and remember for many years to come!